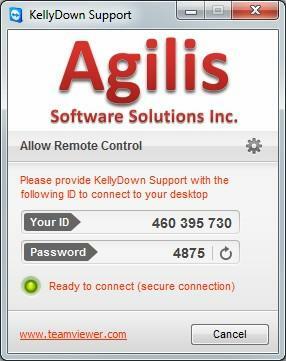 In the event that you experience difficulties installing or running KellyDown on your computer, or you need help with some of the functions in KellyDown, consider downloading and installing the Agilis Remote Control utility to enable KellyDown Support to access your computer remotely via the Internet. TeamViewer is a highly secure remote maintenance solution. Your connections are established via fully encrypted data channels using 1024-bit RSA key exchange and 256-bit AES session encoding. TeamViewer GmbH is one of the very few companies on the remote control market with a certified quality management system according to ISO 9001. This is an additional verification that their quality system meets internationally accepted standards. TeamViewer includes full encryption, based on RSA private/public key exchange and AES (256 Bit) session encoding. This technology is based on the same standards as https/SSL and is considered completely safe by today's standards. In addition to the Partner ID, TeamViewer generates a session password that changes with every software start to provide additional security against unauthorized access to a remote system. The key exchange also guarantees a full client-to-client data protection. This means that even the TeamViewer routing servers will not be able to read the data stream.